It's already been 2 months since Luminato 2018, can you believe it? After a super successful festival it's hard to believe that Pumpkin Spice season is upon us. A huge thank you to our sponsors and partners, donors and artists, and every single audience member who made Luminato 2018 possible! This month we caught up with some of our festival family to see what's next on the cards. Keep reading for info on TiKA's model behavior, and details on Toronto's next musical masterpiece. The soulful and sultry TiKA blew us away with her vocals at this years festival. If you missed out, don't worry - you can see her megawatt HD smile lighting up Yonge and Dundas Square. 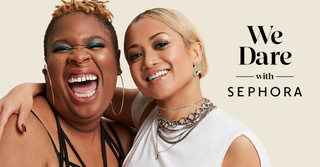 TiKA is featured in Sephora Canada's newest campaign, #withsephora with her likeness splashed across billboards, posters and ads around the city. Relive the energy and electricity of her Luminato performance at her upcoming concert, Venus Fest, a celebration of women and non-binary artists, 21 September at the Opera House. Meanwhile our friends over at the Musical Stage Company and Outside The March are only two weeks away from the World Premiere of Dr. Silver: A Celebration of Life at Heliconian Hall. From two of the most innovative artists in Canadian musical theatre, Anika Johnson and Britta Johnson, this immersive production features an all-star Canadian cast. Check this sneak peek of the 'Silver Singers' in their brand new video trailer. We presented a sold-out workshop of this new musical as part of Luminato 2017. Now is your chance to see how a piece is transformed in just a matter of months! Running 13 - 30 September, get tickets while they're hot.